In their latest quarterly reports on the mobile industry, Gartner and IDC have reported numbers that are wildly different, with Garner counting 77 million additional units sold. Gartner also assumes the use of Android by a large number of unspecified "Other" phone manufacturers, greatly reducing the market share of Apple, RIM, and even the major Android makers. That huge discrepancy in counting global phone sales is, as noted by Asymco blogger Horace Dediu, "nearly as big as all the smartphones sold (81 million). This is not within any margin of error for whatever sampling method they use." Dediu added that IDC and Gartner "need to clarify this because until they do, neither is credible." The huge difference in reported phone sales allowed Gartner to describe a huge category of "Other," unnamed phone vendors who the firm claims are now collectively selling low end phones at an astoundingly high growth rate well above the rapidly growing HTC and Apple, and incredibly far above the industry average growth rate. According to Gartner, this "Other" category reportedly ballooned from 16% to 33% of the mobile phone market in one year. Dediu wrote that Gartner analysts "state that the incumbent vendors are being pressured by these low end [other] entrants. They go on to explain that the same set of vendors will probably use Android to enter the smartphone space." Nokia added a few thousand units but still slipped in market share; second place Samsung boosted sales by more than 10,000 units but still slipped in market share; RIM grew sales by three thousand but remained nearly static in market share, while Apple nearly doubled its phone sales (thanks to the launch of iPhone 4) and yet only inched up a little from 2.3% to 3.2% of the overall phone market. LG, Sony Ericsson and Motorola all slipped significantly in quarterly sales, while the much smaller ZTE and Huawei increased sales (but not significant market share). Outside of these brands however, the Other category ballooned dramatically from 49.8 million units to 137.8 million, a fantastic increase that gobbled up twice as much market share as Gartner assigned to "everyone else" a year ago. Gartner's figures by operating system (rather than vendor) suggest that a large part of this "Other" growth is benefitting Android. While Gartner notes that the major Android licensees Samsung, Sony Ericsson, Motorola and HTC have only grown their sales moderately (or none) over the past year, and that all have actually lost overall market share, it reports that Android as a platform has ballooned from 3.5% of the market to an incredible 25.5% of the smartphone market. Symbian, Apple's iOS, RIM, Windows Mobile, Linux and "Other OS" were all assigned flat or sharply lower market share, making it clear that Garner is assuming that most of the smartphones included in its 88 million new phones attributed to "Other" vendors (77 million of which no other firm has noticed in its own counts) must all be using Android. 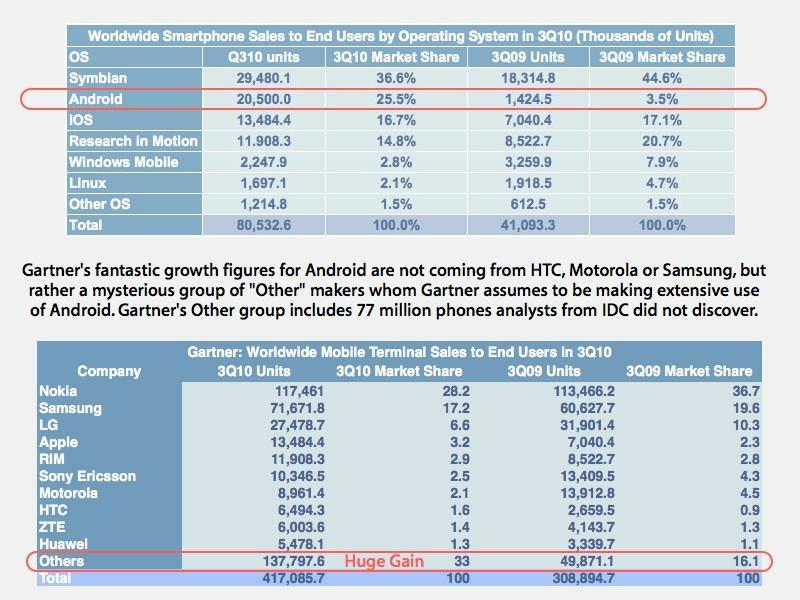 While Android has helped Motorola, HTC and Samsung to deliver popular new models, Gartner's data does not indicate that its fantastic growth rates for "Other" Android makers are coming from sales of the popular Droid, Incredible and Galaxy models. 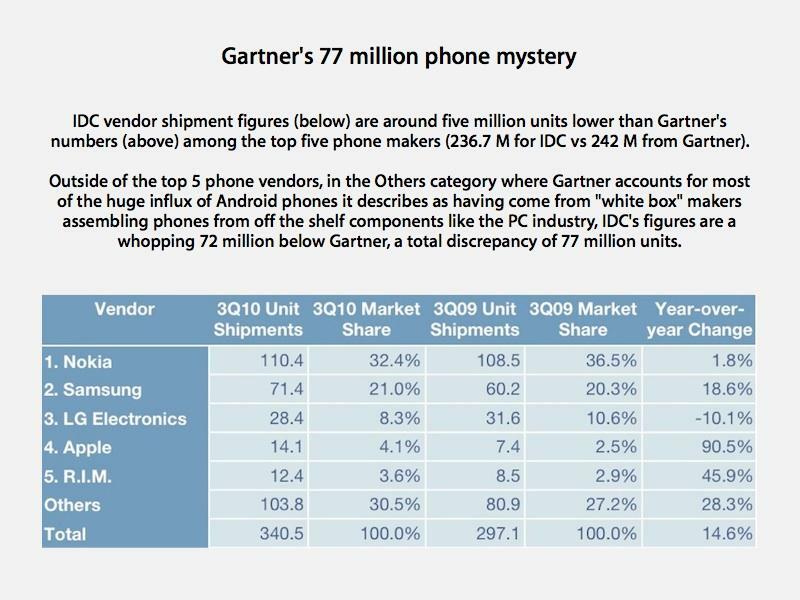 Instead, the vast majority of Gartner's reported growth in Android is coming from unnamed companies more obscure than even ZTE and Huawei, and all small enough not to figure into Gartner's top tepee vendor brand list. Gartner does not figure Apple's iPod touch and iPad sales into its mobile numbers, so presumably the firm isn't counting a huge swell of off-brand Android tablets or other devices to pad Android's purported growth. Where are these huge numbers of small phone companies selling their tens of millions of phones, what brands of phones do they sell, and why aren't these tens of millions of users showing up in Android app store sales or web use statistics? Gartner hasn't offered any challengable details. Because Gartner bases its numbers on sell through to end users, while IDC's figures are based on sell in to vendors, any balloon of inventory should be reported by IDC first, rather than showing up in Gartner's figures of actual phones sold. A report by Philip Elmer-DeWitt of Fortune cites a comment from a Gartner PR representative explaining where these "other" phones might be. "Effectively, many companies can now assemble large numbers of handsets cheaply using readily-available components —in much the same way that white box PC manufacturers were able to do so in the past. These companies are increasingly exporting to countries with high demand for basic handsets." Given that mainstream Android phones sell for about $600, it's hard to imagine that a vast segment of new low cost phones are reaching well below $100 because of Android, or that if these phones were using Android, that they would be recognizable to users in the West as Android smartphones. A profile of "the five cheapest Android phones in India" by India Business Blog lists models all selling for around $200 to $300, far above the $52 ASP Gartner cites for the region. Certainly the majority of India's phones can't be running Android, and other market data does not show this to be the case. While Android offers a less expensive smartphone platform than Windows Phone 7, it is not price competitive with embedded devices that do not require the minimum components needed to host an Android smartphone, exemplified in the $200-$300 Android models now available in India. The Fortune report also included a comment from a former IDC employee, who notes that his firm regularly based its market share figures on manufacturer's reported sales. "We just did some systematic adjustments to the vendor guidance and called it a day," the reader explained. He portrayed the industry's analyst unit counts and market share growth statistics, not as a scientific exercise, but an effort to create numbers that "maintain the fiction because it was convenient." He writes that the goal was to "preserve the growth rates; to hell with the actual numbers. Even the growth rates are fiction. "The fudge is in the 'others' category, which is used as a plug to make the numbers work out. In fairness, we did do survey work, calling around, and attending white box conferences and venues to try to get a feel for that market, but in the end, the process was political. I used to tell customers which parts of the data they could trust, essentially the major vendors by form factor and region. The rest was garbage." Gartner has historically worked to influence public opinion by crafting numbers that support the firms that support it. In the late 90s, Gartner partnered with Microsoft to release research that said WIndows provided lower Total Cost of Ownership compared to competing thin client Network Computers. Gartner later announced research in 2005 that Microsoft's Windows Mobile 5 would largely defeat Symbian as soon as the company shipped it. In reality, Symbian still remains in the lead today, only having take a beating from the iPhone, RIM, and Android. Windows Mobile never really even threatened Symbian. Gartner has most recently announced that Android would become the second largest mobile platform by 2012, releasing research that said Android's market share would grow 400 percent in two years, Windows Mobile 7 would grow by 70 to 80 percent, Apple would remain stagnant, and RIM would drop by half.